The automobile has come a long way since German inventor Karl Benz invented the very first car in the world in 1886. Cars have become indispensable in the modern world, with their presence in pretty much every nation on the planet. The advancement of the car as a means of transport in the past century has given rise to many huge, successful businesses, collectively known as the automotive industry. This is an industry with two companies on the Fortune 500 (Ford Motors and General Motors) and several other giant players with hundreds of billions in market capitalization. The current corporate structure of Porsche SE, the parent company of Volkswagen Group, which has a majority stake (if not a full stake) in the following companies: Volkswagen AG (the company in the center of this emissions scandal), Sokda, Seat, Audi, Bentley, MAN, Lamborghini, Scania, and Bugatti. Porsche SE, under its holding company, therefore essentially controls the VW Group. It's a huge market, not withstanding newcomers like Tesla motors that have themselves seen booming growth amidst another technological renaissance the likes of which we haven't seen in a long time. The industry has manufacturers hailing from all over the globe. Japan for instance has Toyota, Korea has Hyundai, America has Ford and GM, and last but definitely not least, Europe with Volkswagen AG, BMW and Daimler AG (Mercedes-Benz). Personal transportation is serious business with equally serious amounts of money being sloshed around. Earlier last week, the automotive industry (and the rest of the world in general) got hit with a shocking flash of a deep crimson shade of red: Volkswagen AG, one of the world’s largest and most well-known automakers was found to have flouted emissions regulations by the United States Environmental Protection Agency (EPA). On 18 September 2015, the EPA issued a Notice Of Violation to VW, essentially notifying the automaker and the world of the transgression. Car makers throughout the globe have since shimmered in fear, with crosses fingers as the fissure continues to deepen as the days pass. This revelation, for lack of a better word, has sort of opened a Pandora's Box of ugly truths. Truths that automakers are shy to admit, until luck has its way; a scapegoat is caught with a smoking gun, there's no running away now. From the way things have since panned out, this shakeup is proving to be ginormous and very, very costly for the world most prolific automotive group. "The United States Environmental Protection Agency (EPA) has investigated and continues to investigate Volkswagen AG, Audi AG, and Volkswagen Group of America (collectively, VW) for compliance with the Clean Air Act (CAA), 42 U.S.C 7401-7671q, and its implementing regulations. As detailed in this Notice of Violation (NOV), the EPA has determined that VW manufactured and installed defeat devices in certain model year 2009 through 2015 diesel light-duty vehicles equipped with 2.0 liter engines. These defeat devices bypass, defeat or render inoperative elements of the vehicles' emission control system that exist to comply with CAA emission standards." 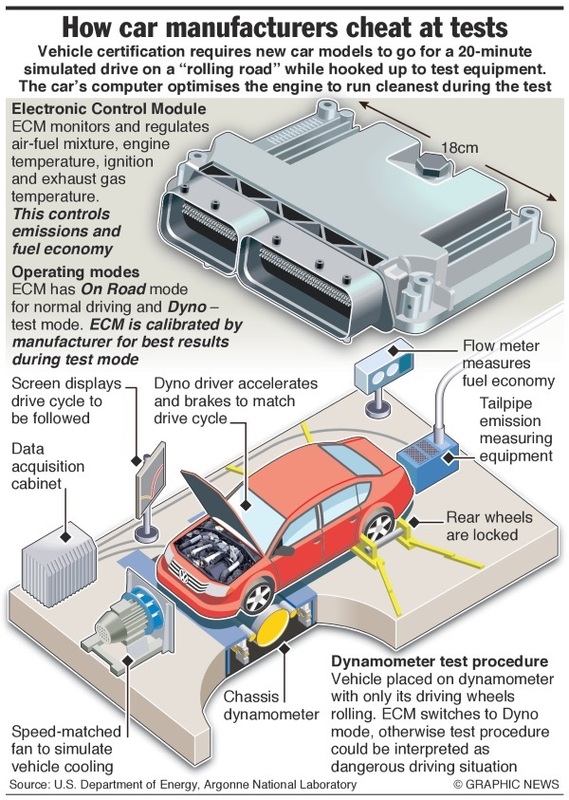 The engine control unit (ECU), depicted here as the engine's electronic control module (ECM), is at the heart of the VW emissions scandal. The ECU, basically a small computer, controls the engine's parameters including fuel consumption, throttle response, fuel-to-air composition, power output, and efficiency; which gives the ECU direct control over the amounts of exhaust gas emissions. Standard vehicle certification tests require manufactures to put their vehicles through what is known as a dynamic rolling test, which aims to emulate conditions as if the vehicle was actually transversing in real life. Sensors which monitor different aspects of the vehicle's performance, including exhaust emissions, are fed into a monitoring system which matches the sensory data inputs to respective test calibrations. In VW's case, its ECU were programmed to recognize physical cues that prompt it to engage the so called "test mode"; a mode which dramatically reduces exhaust gas emissions while mimicking dynamometer performance, allowing VW vehicles to appear cleaner than they could ever possibly be on the roads. The deceit was achieved by inserting software code into the vehicles' engine control units (ECU) that tracked steering and pedal movements. Whenever the software detected that testing was in progress, it altered the way the engine operated. This led to emissions produced and measured as being lower by as much as 40 times in testing as compared to those produced during real world use. The problem was not spotted by official regulators for years, but was eventually uncovered in 2014 by an independent organization, the International Council on Clean Transportation (ICCT). 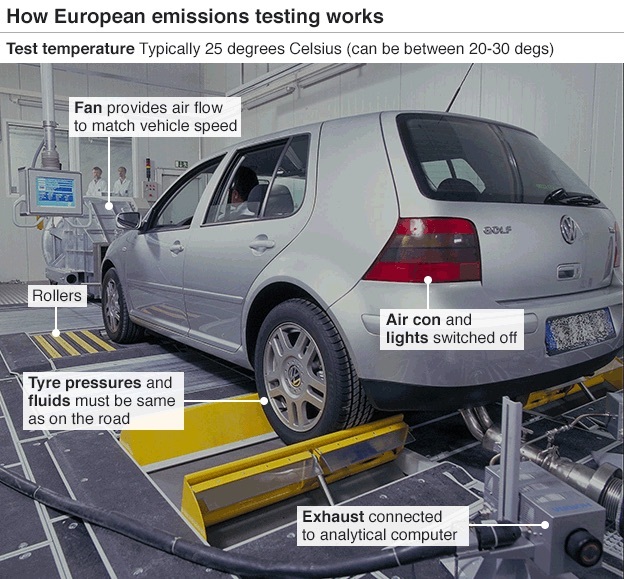 The ICCT noticed a discrepancy between lab tests and real world performance for several of VW’s diesel cars in Europe. Testing was done with US cars instead of European cars due to the US’s far more stringent emissions regulations. The result? Discrepancies in engine performance between lab results and the real world for several of VW’s hottest selling cars, including the diesel Passat and Jetta. For comparison, a BMW X5 with its own diesel power plant, which was also tested under the study, had no such discrepancies at play. A group of researchers from the West Virgina University then worked with the ICCT to test VW’s cars in the US itself. The results matched that of Europe's: VW cars tested (Passat and Jetta power by TDI engines) emitted pollutants up to 35 times the legal limit. Ex. Volkswagen Group CEO Martin Winterkorn has resigned from his post following unprecedented backlash over the ongoing emissions scandal. With overwhelming evidence and upon pressure from the EPA, VW has since come clean on the issue, leading to a chain of previously unfathomable events at the company: VW Group CEO Martin Winterkorn resigned following the scandal; Head of Brand Development Heinz-Jakob Neusser, Audi R&D head Ulrich Hackenberg, and Porsche R&D head Wolfgang Hatz were suspended shortly after. The news naturally sent shockwaves through the financial markets, with automakers bearing the brunt. VW shares plunged more than 20% on the Frankfurt Stock Exchange on 21 September 2015, the first trading day since the EPA report became public knowledge. VW's stock then fell another 22% the following day, erasing a whopping 32% the company's market capitalization less than 48 hours. Investors were clearly spooked by the sudden and negative turn of affairs for the company. Interestingly, but perhaps unsurprisingly, stock prices of Daimler AG and BMW, VW’s fellow German counterparts were down 5.8% and 4.9% respectively, perhaps guilty through association. Since news about VW's emissions scandal de grande, Volkswagen shares have plummeted close to 40% in what can only be described as carnage. Investors remained plastered to news wires, hooting that things do not get worse. At this rate, VW shares will hit record lows in no time at all. VW has admitted that some 11 million cars could be affected. That is, by any measure, a staggering number. The cars affected are fitted with VW’s Type EA 189 2.0-litre turbodiesel engine. This basically means practically the entire range of VW’s TDI engines, and certain Audi motors would contain the emissions-flouting device. It is little wonder to us that VW suffers hefty financial consequences as a result of this scandal. For VW, the horror has just begun. The company plans to recall almost 500,000 cars in the US alone. Announcements have been made for recalls in other countries, including a massive 1.2 million in the UK, with many hundreds of thousands more planned across the rest of the world. The affected vehicles will need to be sent back to their respective service centres to have the malignant software modified or removed. The financial and logistical headaches of these recalls are very real and harsh for VW. VW has set aside €6.5bn to cover the financial damages brought about by the scandal. However, with the way things are going for the beleaguered company, this amount might as well ballon further. For instance, the US's EPA has the power to fine the company up to $37,500 for every vehicle that fails to meet its standards. That’s $18bn in potential fines. VW’s own losses and pain from the scandal are just half the story. The other half belongs to the carmaker’s customers, who will most likely suffer negative consequences that were due to no fault on their part. Diesel engines have long been known for their superior fuel efficiency over petrol powered engines. However, diesel engines are typically rougher and more harmful for the environment. In recent years, improvements in technology has led to the phenomenon of “clean diesel”, where the engines emit less sulphur (by up to 97%), but are yet still more fuel efficient than a comparable octane powered one. The company's award winning TDI engines became the hallmark of the small displacement diesel engines for consumer vehicles, including cars and light duty trucks. VW's trademark TDI technology stands for 'turbocharged direct injection'. It can be said that VW were the pioneers of today's modern turbo diesel engine, coming under many different iterative names the likes of CDI (Mercedes-Benz), TDCi (Ford), i-DECT (Honda), CRD (Jeep), CDTI (Opel), D-4D (Toyota), dCi (Renault), and so on. Such technologies generally involve diesel fuel being injected directly into the engine's cylinders at very high pressures via a common-rail fuel line with special piezo-electric injectors, boosting efficiency as fuel is essentially vaporized into extremely fine particles, mixing well with air that is further pressurized by forced induction (versus naturally aspirated intakes) achieved by utilizing tiny turbocharger which itself is power by the engine's waste exhaust gasses that would otherwise be wasted through the rear. Diesel engines adopting the turbocharged common-rail technology have better performance and fuel economy when compared to traditional older diesel engines. When pitted against modern petrol engines, modern turbo diesels will still be superior in terms of fuel economy, but loose out in performance and emissions. There is general a widespread misconception that modern turbo diesels are better than their equivalent petrol rivals. This is clearly not the case especially with the advantage of hybrid drive technology where already efficient petrol engines are intelligently paired with electric motors and batteries to deliver extremely high levels of efficiency and low carbon footprints. Before the scandal, VW built a reputation for being greener, cleaner than other automakers. Or at least so it seemed. VW’s ‘Clean Diesel’ engines featured prominently in their marketing: From car information posted on official websites to pictorial and video advertisements. You would find VW cars with ‘Clean Diesel’ slapped on the side of it in showrooms. Customers did not mind forking out the extra cash to have a ‘cleaner’ car, both for their conscience and for the environment. Now, these same customers feel betrayed and cheated. Trust has been mismanaged. VW have already set plans in motion to rectify the issue. Slowly but surely, a worldwide recall of affected vehicles will ensue. The fix, which would either remove or modify the cheating device in the engine would most likely reduce fuel economy and engine performance. As if that was not enough for the consumer, resale values of VW vehicles are likely to fall. These effects have angered multitudes of VW owners worldwide, some of which have planned to file class-action lawsuits against the company. Sales are expected to slow. VW hasn’t just stepped on the toes of the authorities this time – they have lost the most valuable of all, customer loyalty and trust. The answer to this is simple. Diesel VW cars sold in the US were allowed tax breaks, an incentive that made VW diesel cars more attractive to consumers. There is also the science behind it all: Diesel contains more energy per gallon compared to gasoline – hence, more mileage on the road (around 30%) more than average octane gasoline. An actual vehicle certification test being conducted on a VW Polo. Such tests are well calibrated to recreate real life conditions as best as possible. However, as Volkswagen vehicles have shown, it is all too easy to game loopholes in this system with a few medications to the vehicles' onboard computers. Diesel is also generally priced slightly lower, making it a cheaper, more attractive option for consumers, especially for those who travel a lot. There is however a catch: Diesel emits more nitrogen oxides (NOx) one of the formative compounds of smog, and unhealthy particulate matters. These pollutants can result in serious negative health and environmental effects over time, as has been studiously proven over thousands of researches. The U.S. has always had very strict emissions regulations, unlike Europe, where slacker emissions regulations have led to diesel cars making up more than one-third of all cars on the continent. However, the negative effects of diesel are clear to see: Smog in diesel-filled Paris got so bad, city officials made public transport free and banned half of the city’s cars for a day in an effort to alleviate the smog situation. Thus, diesel engines save money and increase mileage ratings for the consumer – but with a trade-off for more pollution. The challenge then, for automakers, is to have diesel engines achieve the desirable balance between fuel economy and emissions. Improvements in technology have led to manufacturers being able to successfully design and build so called ‘clean diesel’ cars. These cars have engines designed to lessen the trade-off between performance, fuel economy and pollution. At the same time, the Obama Administration has been steadily raising the CAFE (Corporate Average Fuel Economy) standards for automakers. This simply means a greater premium is now placed on fuel economy. With this paradigm shift, the more efficient diesel car began to prove increasingly popular in the U.S.. Bear in mind though, the U.S.'s EPA still has some of the most stringent emissions regulations of anywhere in the world – so manufacturers had to achieve the sweet amalgamation of great fuel economy (which is a given in a diesel) and low pollutant footprints from their diesel engines. In came VW. With a solid reputation as a safe, reliable, green German car manufacturer, the company took advantage of the situation and sold over 482,000 ‘clean’ diesel cars in the U.S.. These cars, which included versions of VW’s hot selling Passat, Golf, Jetta, and the Audi A3 contained the proverbial diesel Type EA 189, 4-cylinder, turbocharged, direct-injection engine. Of course, as we all know by now, VW failed in its quest to make a cleaner, greener diesel. So, it took the easy way out. Software, that should have never been there in the first place, was incorporated into the cars' systems which helped lower pollutant emissions when the cars were being tested. The ruse worked. For 6 long years, since 2009, the EPA was none the wiser. VW shares have being losing value in a waterfall decline since news of the scandal broke, with no bottom in clear sight. Brand reputation has sunk to an all-time low. Sales for Q3 and Q4 are expected to be severely hit, making the potential financial punishment an even more painful prospect. The Volkswagen emissions scandal in numbers. An infographic showing how much the beleaguered company is set to loose, and puts it in perspective of VW's production capacity. Credit Suisse estimates that the total cost to the company could hit €78bn ($87bn), should the worst happen. The bulk of the cost, as believed by the bank’s analysts, would go to compensating owners of affected vehicles for losses in value. The bank values VW shares at around €82 each, implying further declines in its stock prices. VW disagrees with Credit Suisse's figures, jousting it as “pure speculation” and “nonsense” calculations. Consumer sentiment on VW and Audi have also worsened. A survey of more than 500 vehicle owners conducted by AutoPacific revealed only 1 in 4 vehicle owners had a positive opinion of VW in the wake of the scandal, compared to 3 in 4 before. 64% of respondents stated they did not trust VW, with the same percentage believing that other automakers are or may be using defeat devices on their own diesel vehicles too. Audi, one of VW’s brands affected directly by the scandal was not spared either. A mere 29% of respondents had a favourable opinion of the brand, compared to 69% percent before the scandal went public. Rival automakers have come under scrutiny by the EPA, with diesel cars made by BMW, Chrysler, General Motors, Land Rover and Mercedes-Benz slated to undergo probes for similar defeat devices in their engines. So far, no other automakers have been found gaming loopholes in the system. VW is embroiled in its worst crisis in 78 years. The company, the world’s third largest automaker, is now facing financial and legal consequences that threaten to bring it to its knees. While it isn't the first time an automaker has tried to cheat the emissions polygraph, the scrutiny from authorities and the public alike are considerable. If history were to serve as an indicator, we can expect the auto giant to pull through and emerge wiser and stronger from the scandal. It will however take an enormous amount of work as we will see.